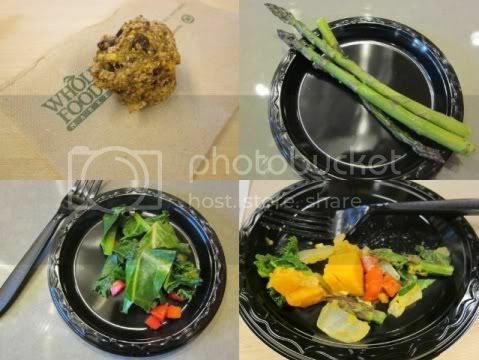 At last week's class, Becky and Karen (our Whole Foods Healthy Eating Specialists) showed us how to cook a few different ways without using added oil. I was skeptical going into it - I'm Italian, one of my natural reflexes is to always have olive oil in the cabinet and grab it no matter what I'm about to cook - but I can honestly say, they were right. Mighty Muffins (from the Engine 2 cookbook), roasted asparagus, collard greens and bell peppers, and butternut squash and onions (mixed up with the asparagus and collards). I've always believed that I needed to use oil when sautéing or else the food would stick to the pan. The ladies explained to us that the food isn't sticking because there's no oil, it's because of the heat and the pan itself. When you heat up a pan, the particles that physically make up the pan expand. When you add oil, the moisture in it makes the particles contract - but if you add your meat/veggies directly without any oil, the particles contract with the naturally occurring liquid in the food, and therefore, the food sticks. But the thing is, you don't necessarily need oil to make the pan non-stick, just a liquid. So what can you use instead of oil for baking, "steam-frying," and in marinades? I went home and tried to caramelize onions myself - and wouldn't you know, it worked! Heated up my pan, added a couple of tablespoons of water to contract it, then added my chopped raw onion. They turned out just as well as any time I've made them before - brown, soft, sweet - except this time, they weren't oily. I tossed them together with a potato I had chopped up and boiled and some oil-free chorizo-flavored seitan made by a local company for a bowl of breakfast-for-dinner (the only meal I love more than breakfast-for-breakfast). 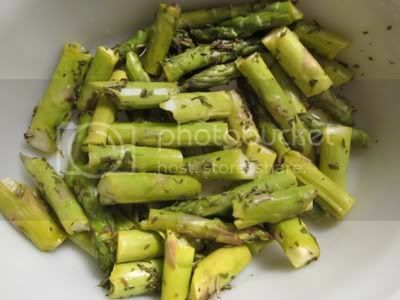 A few days later, I roasted some of my own asparagus with an orange juice marinade and sprinkled them with herbes de Provence. Flavorful, not greasy, and low in calories. I chopped them up and had it with tofu noodles for a light but satisfying lunch. It's important to note that this eating plan is not low-fat or fat-free. The focus is on naturally occurring fats over animal-based or even plant-based added fats. It's about choosing avocado in your salad over oil and vinegar, for example. I can put coconut and pecans in my morning oats, olives in my salad for lunch, and tofu/seitan/beans in my dinner bowl with rice/quinoa/lentils - so my meals are full of healthy fats, but with no extra fats/oils added. Basically a green smoothie with no liquid added. Frozen spinach, fresh blackberries, food processor (or blender if you have one). Cool, sweet, quick, only about 100 calories - and, of course, oil-free. What about you? Do you usually cook with oil? What's your favorite summery light dessert? I usually use oil just for roasting, and then only a little tiny bit - usually not for sauteing things, since I feel like a little oil does NOT go a long way there. Love these suggestions to replace it! I'm a water guy when it comes to cooking in a frying pan. I actually came across it by accident. I was frying some vegetables to put om some pasta and forgot to put the oil in and the closest thing to me was a cup of water, so I chucked some of the water in and it cooked perfectly and tasted great. Since then I try and cook most things with water. I might give vegetable broth a go though, thanks for the tip! I ALWAYS use olive oil because I thought I had to to avoid the sticking thing, but now I know I don't have to use it w/ EVERYTHING which is great, so thank you for this post, Mary! I have a pump sprayer that I fill with olive oil. I just use a light spray before sauteeing veggies or whatever I am cooking. I prefer to use olive oil rather than use the artificial cooking sprays like Pam. My love for asparagus is never ending! I use a bit of spray for some things and oil for others. I'm happy to add fat to my diet with olive oil. My brain needs it and I hardly eat meat so I get it other ways. I have taken to "sauteing" in water or broth. If my veggies (and what I am eating them with) have no natural oils, I add some so the vitamins will be absorbed. I think I will try Hungry Girl Fan's idea of spraying olive oil. So you make a green smoothie with spinach. I came here to look that up (I got a new blender) and here is the answer! 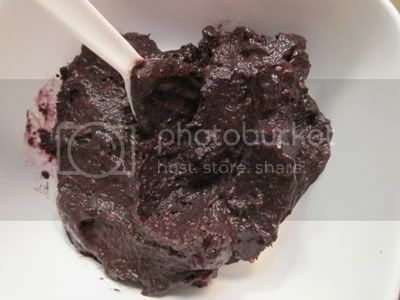 That paste looks like it needs a smoothie! : ) I wonder what it would taste like baked under some granola and oats and nuts (no sugar added). I wish I could find tofu noodles around my town. That dessert looks delicious! I love canned peaches in the summer...they remind me of BBQs when I was a kid. I'm REALLY glad you explained how the oil/water/etc. works with the pan...very useful! I'm Italian too so I always reach for my evoo to cook. Maybe I should try some of these other methods. I have never thought of steam-frying.